We’ve created a map to help you avoid the worst of the traffic in Aggieland on game days! We know just how congested Bryan / College Station can be on Aggie game days, and we have mapped out (literally!) ways for you to sneak around the heaviest of the traffic! 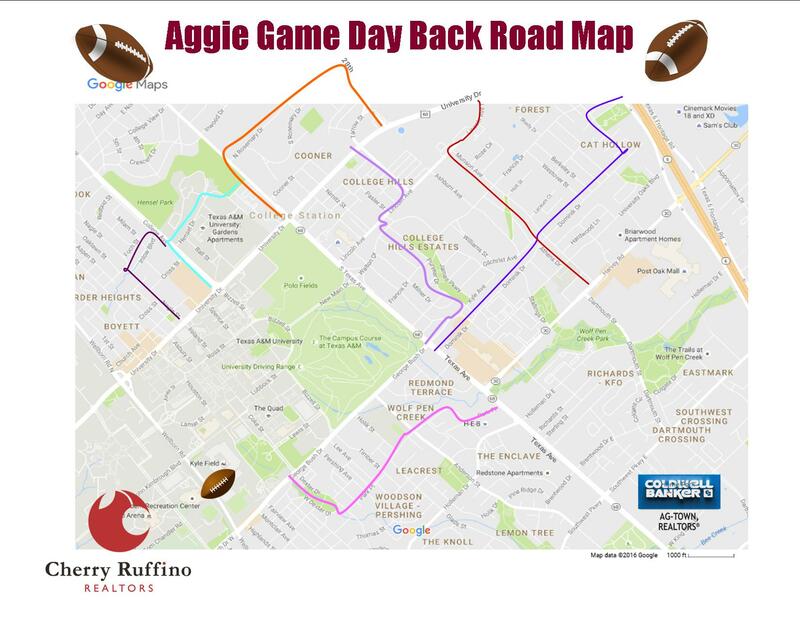 Check out these different back-road routes around Aggieland that can be taken on football weekends when you’re headed to campus, your hotel or to get a bite to eat. Kyle Field’s capacity exceeds 102,000– that’s a lot of people all leaving after the game, but don’t fret, we know a few secret routes you can take around College Station to help avoid the game-day traffic! The Hot Pink Route (Dexter to Park Place) is best for cutting around crowded George Bush Drive before or after the game. This route will spit you out next to the HEB on Texas Avenue near Holleman Drive. The Navy Blue Route (Dominick Drive) is a quick route to get to Highway 6 from George Bush Drive and Texas Avenue. The Brown Route (Nagle St. to Inlow Blvd.) is a great shortcut for after the football game, to cut around University Drive (Northgate traffic) then connect to Bright Blue Route to end up on Texas Avenue by Café Eccell– this is helpful because they have changed the light schedule at Texas and University and it takes a lot longer! The Bright Blue Route is a great route to cut out University Drive traffic (aka Northgate Traffic) and pop out on Texas Avenue near Café Eccell. The Orange Route (Rosemary Drive to 29th) is not only one of our favorites because of the beautiful, jaw-dropping homes, but it is a local favorite back road (shh! don’t tell) because it is a super fast way to get from Texas Avenue to University Drive (at The Hilton). This route helps especially with all of the new medians that the city recently added to University Drive. Do you have a ‘secret’ passageway in Bryan / College Station? Feel free to share it!